Oct. is the time of year when political advertising makes its way to voters by the bushel. Some political advertising is fairly transparent, however, slate mailers can be disturbingly deceptive. Slate mailers are any mailer recommending a “slate” of candidates and/or propositions for the purpose of influencing a voter recipient. Some mailers, like Election Digest and Educate Your Vote, actually solicit payments from campaigns to have their favored candidates and propositions listed on their slate, through a “pay-to-play” arrangement which is typically not apparent to voters. Dr. Thomas Corrigan, Assistant Professor of Mass Communication at California State University, San Bernardino (CSUSB) and volunteer students have begun a crowdsourcing Twitter campaign with the hashtag #ShowMeYourSlate to shed light on the role of slate mailers in California elections. The crowdsourcing campaign asks Californians to share their slate mailers on Twitter with the hashtag #ShowMeYourSlate. In doing so, Corrigan and his students hope to see how political campaigns are using slate mailers to target voters with tailored, paid-for messages. Crowdsourcing participants can post photos of their slate mailers on social media with the hashtag #ShowMeYourSlate, or they can be emailed to [email protected]. Dr. Corrigan has examples of two mailers he received in his mailbox. One directed to him showing the representative American bald eagle, a sign of masculine strength; the other specifically targeting his wife with much more feminine colors and a reference to children and literacy. Both mailers were identified with, “A project for the Coalition for Literacy,” however online research showed only one instance in which the coalition has contributed to a literacy-related cause. 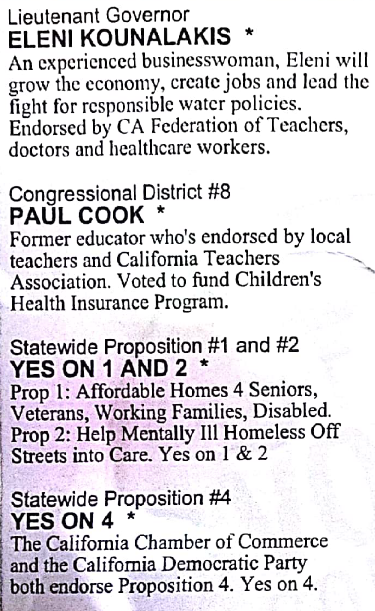 “These slate mailers looked like the political mailers we see so often in our mail, but when you read the fine print, you realize that every candidate and proposition listed is actually a paid advertisement, not an endorsement from the Coalition for Literacy. It is a really deceptive practice,” said Corrigan. Election Digest and Educate Your Vote receive their funding via advertising purchases from political candidates’ campaigns, and from organizations seeking to pass or defeat California’s various ballot propositions. A political consulting agency, Larry Levine and Associates, creates and produces both of these slate mailers. The slate, shown here, identifies candidates and propositions that have paid to be included with an asterisk. The slate, shown here, identifies candidates and propositions that have paid to be included with an asterisk. In the case of the mailers, Dr. Corrigan and his wife received, every single candidate and proposition on the slate was a paid-for advertisement. Although some of the causes advocated on a slate mailer — presidential, senatorial and gubernatorial candidates and an occasional well-publicized proposition — are typically known to voters, most of the candidates and propositions on the slate are not. By means of the prominent causes that are advocated and the symbols and messages contained on the slate, the slate identifies itself with a broader cause or point of view. The #ShowMeYourSlate crowdsourcing movement aims to further research on political advertising and to provide voters with more visibility into these stealthy influence operations. “Self-governance only works when voters are well-informed, but that can’t happen when advertisements for candidates and propositions masquerade as independent endorsements. Hopefully, through this crowdsourcing campaign, we’ll be able to learn more about how mailers like this are being used to message across the state, while, at the same time, raising awareness about these deceptive political advertising practices,” said Corrigan.